This is a story of dispersed Danshui-ren coming home to "尋根". And on 9/28, internet friends Mr H (accompanied by his daughter), EyeDoc and Mr Kure"Go" finally met up in Danshui. All were born in this lovely town, not long before the end of the war, in the early 1940s; fate, however, has led each of them down unusually different paths. And today is the day for all to come back to the point of their origin. As indicated in the pictures, Mr H was born in 1940 in the house directly across the street from EyeDoc's. 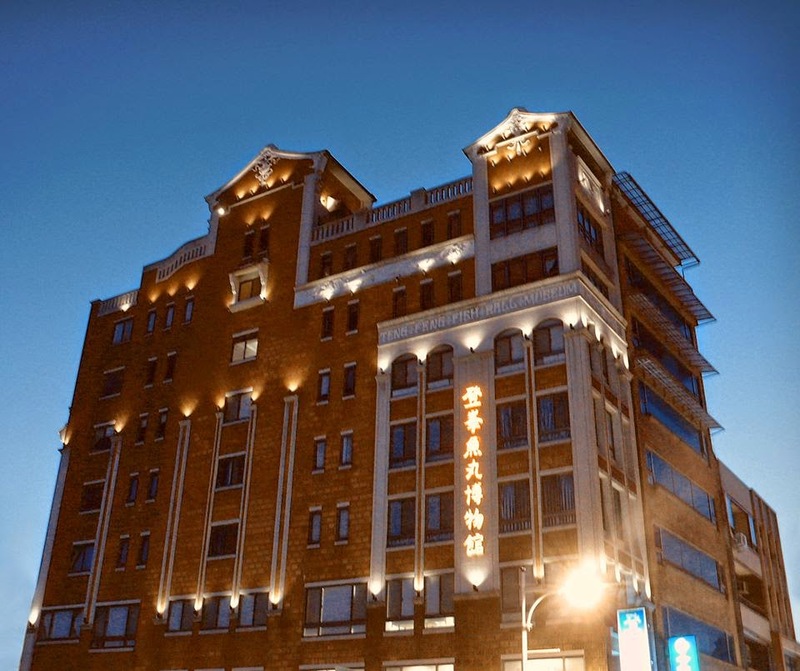 His grandmother had been the manager of 公會堂 since the 1920s. And his father had taught at Danshui and 三芝San-zi elementary schools. In 1946, they were all repatriated back to Hiroshima. Mr Kure's great grandfather was the mayor before the war and his grandfather (mother side) the principal of Danshui elementary school for many years after the war. His family had moved to Nakasaki immediately after the war when he was only 2-3 months old. He, as EyeDoc, still has relatives and family friends living in Danshui. Some came to help locate old sites - many stores on the now Chung Cheng Road were owned/operated by Japanese immigrants. The office of the Mayor of Danshui has officially welcome them back home, followed by a reception at the 115-year-old Danshui Elementary School hosted by Principal Lin and two other past principals, one of them 80 years young. Everyone at this get-together is tied, in more ways than one, to the school. This is true not only for Mr H and Mr Kure, EyeDoc has attended this school and his second uncle was the principal at one time. The school was re-introduced by Principal Lin and, in return, graduation photos of the classes which Mr H's father had taught are shown. And a local TV station came to record this event. After a sumptuous lunch hosted by Principal Lin, the 尋根 group moves on to 三芝 ES. 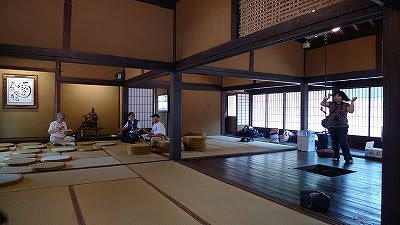 And in the 4-month-old museum established to commemorate the 100th anniversary of the founding of this school, the names of Mr H's father and Mr Kure's grandfather are found among the teachers' roster. Amazingly, history has come alive!! Despite whatever happened in the past during the Japanese colonial rule, ordinary Japanese immigrants did share part of the Danshui history. We see no reason why it should be denied. All parties must come to an end. They have come specifically - Mr H and his daughter from Hiroshima and Mr Kure from Yokohama - for the Danshui meet-up and tomorrow, they will all return to Japan. The true hometown? Why, Danshui of course!! The above is a rare glimpse of the French feet congregating in 馬公Makung of the Pescadores澎湖 in 1885 [source: Paulus Swaen Internet Auction, a dealership of ancient maps]. On March 14, 1885, the French Gov't stopped supporting the battle in Keelung and ordered Adm Courbet to take the Pescadores instead. On March 29, Courbet led the ironclads "Bayard" and "Triomphante", the cruisers "d'Estaing" and "Duchaffaut", the gunboat "Vipère" and the troopship "Annamite" plus 400 Fusiliers Marins commanded by Capt Lang and invaded Makung. The small town was defended by Gen 梁景夫Liang Jing-fu, 周善初Chou Shan-ch'u, and 鄭膺杰Cheng Ying-chieh. There seemed participation of foreigner-advisers, including one Brit whose diary was later recovered by the French. The Qing garrison fought back with Armstrong guns firing from Fort Shi-jiau-tze四角仔要塞 and several other coastal gun batteries. The French fleet bombarded and destroyed the defense in the morning of March 29. The French Fusiliers Marins landed in the afternoon in the southern cape of the island and began to march on Makung. 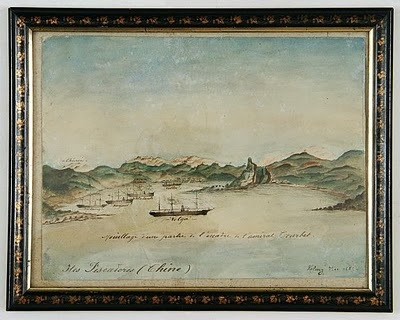 With the support of the naval gun-fire, they eventually defeated the main Qing force on March 31 and proceeded to occupy the whole Pescadores. And Makung Bay became the base for as many as 30 French warships by the summer of 1885. The casualties for the French were 5 dead and 12 wounded, and for the Chinese, 300 dead and 400 injured. The Chinese foot soldiers who retreated to Tainan for medical treatment were noted to have sustained frontal wounds indicating a noble but futile stand against the French. In the painting above, the harbor is seen packed with French ships, Volga, Destaing, Bayard, Atalante, and Volta. In the background is Fort blindé [most likely Makung]. In the background, in the mountains, are the positions of the Chinese troops (marked Chinois). Underneath are notes in brown ink: Mouillage d'une partie de l'escadre de l'amiral Courbet. Iles Pescadores (Chine) - Kelung Mai 1885. So this painting was apparently drawn from memory or finished 2 months later in May in Keelung - the artist also had neglected to sign his name. The French evacuated the Pescadores on July 22. And as any good tourists, they loaded up on souvenirs purchased from local entrepreneurs. Among the favorites were bronze Buddhas, hand-carved screens, and other Oriental trinkets, most likely at a much inflated price. The French were under strict orders to pay for what they needed, souvenirs included. And many islanders made a fortune as a result. It would not be surprising if these treasured items now show up in the antique shops or flea markets somewhere in France. It started out as a routinely busy day. We were in the middle of examining patients when one of our techs came into my room and told us that an airplane had crashed into the World Trade Center in New York City. We all thought that it might have been a terrible accident until things rapidly unfolded. As soon as we had realized that America was under attack, the 50-year-old clinic policy of "never close down the office unless there is a war" finally came into effect. In our practice, many patients came from out-of-town and overseas. And all of a sudden, they could not go home any more because Logan Airport was shut down [it turned out later Logan was where two of the hijacked flights originated]. Our staff made arrangements for the patients to stay at a Holiday Inn nearby. It was a controlled chaos and everybody was worried. Dr U, one of our research fellows, absolutely could not comprehend what was transpiring. She was terrified that she'd be stranded in Boston, never to go back home to Japan again. I called Dr L in my other office outside of Boston and told him to close down and go home. Then I got into my car to drive home myself. There were very few pedestrians on Cambridge Street by this time (around noon). When I got on I-93 North, I was amazed that the normally congested highway was now totally empty. It finally sank in: "This is war!!" For the rest of the day, we stayed in and glued to the TV set. I was thinking that my generation had gone though the last stage of WW-II, the Korean War, the Viet Nam War, and the entire Cold War. Now this. And occasionally a fighter jet would fly overhead. Its high-pitch streaking sounds were very different from that of the commercial jets. It was quite disconcerting. In the ensuing days, we found out a friend lost her brother when the towers collapsed. Another friend's daughter broke down and cried uncontrollably upon hearing the news - she used to work there and many of her friends were now gone. We still feel the effects of 9-11 even today. For one thing, our overseas patient flow slowed to a trickle. And sometimes we have to arrange for them to see other doctors outside of the US. Travel, by air, is no longer a simple matter. TV is showing the memorial ceremony at Ground Zero now. The victims will never know why they were targeted. I hope we don't go through this ever again. 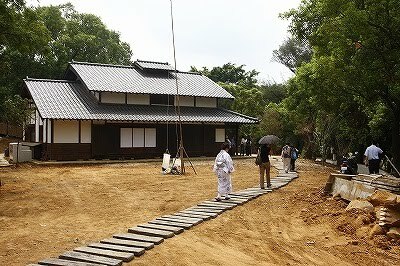 In July, a house in an ancient Japanese style, built in 1915 by the father of Mr 水上勉 [Minakami Tsutomu, 1919-2004], was relocated piece by piece from 福井県Fukui-ken in Japan and re-assembled and re-finished in Danshui, next to Danshui Golf Course. It is christened "一滴水記念館", the namesake of "若州一滴文庫" (a literary library in Mr 水上's hometown), to promote cultural exchange. 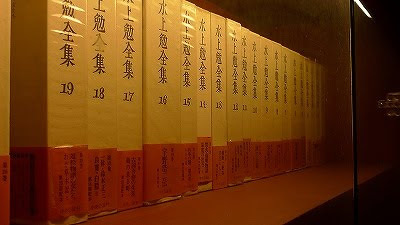 The masterpieces of both Mr 水上 and Mr 陳舜臣 [a Taiwanese writer born in Kobe, 1924 - ] will be housed on site. Mr 水上 was a well-known writer of deductive-detective novels and Mr 陳 specializes in recreating historical events.